Oh Jesus wept it's The Cassandra Crossing. I've seen some dreary crap in my time but this one almost took the biscuit. The titular crossing in question refers to a shonky, rusty and inadequately maintained railway bridge over a deep gorge in Poland. But no-one would never have had to go across it at all had it not been for some bewildered thieves trying to break in to the World Health Organisation building in Geneva. As is typical of such a mission, they both become exposed to a pretty scabby strain of weapons-grade pneumonic plague which the US military keeps there on the hush-hush. When the surviving crimmo tries to make an escape on a trans-continental train to Copenhagen, the US military is forced to take control of the situation in order to keep a lid on the situation. And so armed men in Hazmat suits - one part scientists, two parts terrorist heavies - board the train to ensure that it instead heads off to an old World War II hospital facility (or, more accurately, "hospital facility") in Poland. But with it becoming clear that the sickness is not as serious as was first feared, as well as local intelligence regarding the perilousness of the Cassandra Crossing bridge, the train passengers organise themselves into a guerilla troop to try and retake control of the train. There are two disasters for the price of one in The Cassandra Crossing, the first being the potentially lethal escape of a bacteriological warfare agent and the second (predictable spoiler alert) a train crash. So there's really no excuse for how wretchedly boring this film is. Considering that this is film pregnant with potential tragedy, it takes the largely inexplicable decision to slow play every single element that could provide any grain of excitement or interest. Instead of pus, coughing fits and vertiginous plummets into the European scenery, we get the interminable development of a variety of strands of storyline that no-one in their right mind cares about. Will Burt Lancaster successfully manage to keep the nefarious deeds of the United States government from the general public (he almost invariably will)? Will esteemed doctor Richard Harris rekindle his romance with his twice-wife author Sophia Loren (no-one cares)? Can holocaust survivor Lee Strasberg face spending any more time at a secret facility in Poland (it's unlikely, let's be honest)? Will Ava Gardner get a shag (it's not looking good, Ava)? And will OJ Simpson successfully complete his undercover mission for the FBI and bring arms dealer Martin Sheen to book (nope)? 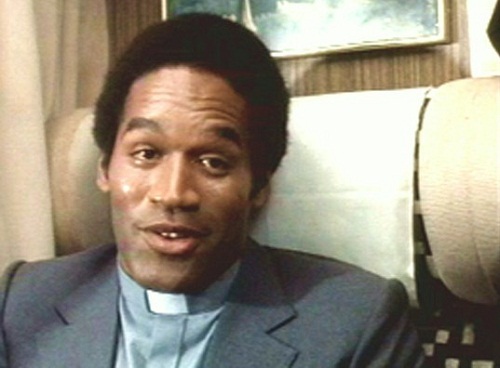 OJ Simpson in The Cassandra Crossing: not really a vicar, what else could this man possibly by lying about? When the disasters finally do occur, they are all much more minor than they might have been with far too few of the desperately dreary dramatis personae perishing in them for my tastes. Which was a double kick in the teeth, if I'm being frank with you. There's so much potential here, you see - all of which that The Cassandra Crossing desperately fails to live up to with flying colours. Even looking past the all-star cast that is on display, there are two explosive and exciting key plot points that are underplayed to such a degree that the end result is barely a disaster movie at all - rather, it's more like a torpid romantic thriller which bores everybody to tears. As such, I can't recommend watching this film to anyone, on any level. It fails as a disaster movie, it fails as a thriller and it failed to engage with me as a drama. It's the longest 129 minutes you could ever wish to spend. Perhaps that's its intended audience - wrongly accused people spending their final day on death row. I give The Cassandra Crossing a dismal THREE out of ten disaster points.